Is LG throwing a fingerprint scanner into the G4 mix? LG has mastered curved screens... what about a fingerprint scanner? If you think the full unveiling of the Samsung Galaxy S6, the Samsung Galaxy S6 Edge and the HTC One M9 at Mobile World Congress mean we're done with the spurious smartphone rumours for a while, then you can think again. 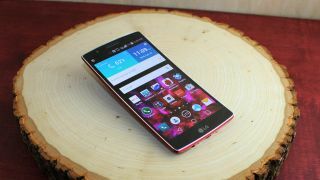 The LG G4 is still in the pipeline, and the newest tidbit of gossip from behind the scenes says the manufacturer has decided to add a fingerprint scanner to its upcoming flagship, pretty much at the last minute. According to a report in the Korea Herald, LG isn't fully convinced about the quality or accuracy of fingerprint technology - though Apple seems to have worked it out - but has decided to get involved so that it isn't left behind in the mobile payments space. "LG Electronics has recently decided to deploy a fingerprint sensor on its next flagship smartphone and the scanner will be placed at the back of the device," an anonymous source told the Korea Herald. LG officials, meanwhile, have taken the time to deny the rumour, so it's up to you whether you believe them or a couple of anonymous sources. That said, biometric security is becoming more common, and if LG doesn't include it until 2016 then it may be too far behind to catch up. Whatever's next from the South Korean company, it should be interesting. Yesterday we heard news that it's working on a whole new line of flagship phones, separate from the G4, which are scheduled to launch during the second half of 2015.